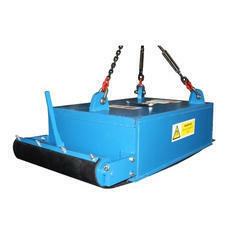 Providing you the best range of electro suspension magnet with effective & timely delivery. The Electro Suspension Magnet is designed High-performance magnet system from an extensive range of designs to suit your application and provide the most effective and efficient method of metal recovery for suspension over a horizontal or incline conveyor, or over the head pulley. A deep electromagnetic field extracts tramp ferrous metal from the conveyor. This type of separator is mainly used in the coal conveying and recycling industries where high levels of contamination and non-stop conveyor processing require a manual-cleaning electromagnet. Looking for Electro Suspension Magnet ?